Work is now progressing quickly for Times Square’s impending Hard Rock Hotel, situated between Sixth and Seventh Avenue at 159 West 48th Street. The 445-key inn is being designed by Berg + Moss Architects. The 225,000 square foot project is being developed by Extell, in partnership with Hard Rock International. The site was purchased by Extell eight years ago for $26 million, along with the necessary air rights that will allow the structure to rise 442 feet tall. The previously existing parking garage has since been demolished, and now work on the foundation is underway. On a plot of land along 48th Street between Sixth and Seventh Avenues, excavation has begun for a 445-key Hard Rock Hotel, designed by Berg+ Moss Architects. The hotel’s Times Square outpost will be developed by Extell in a partnership with Hard Rock International, with an address at 159 West 48th Street. Extell purchased the site back in 2011 for $26 million, along with air rights that bring the project up to a potential scope of 225,000 square feet. 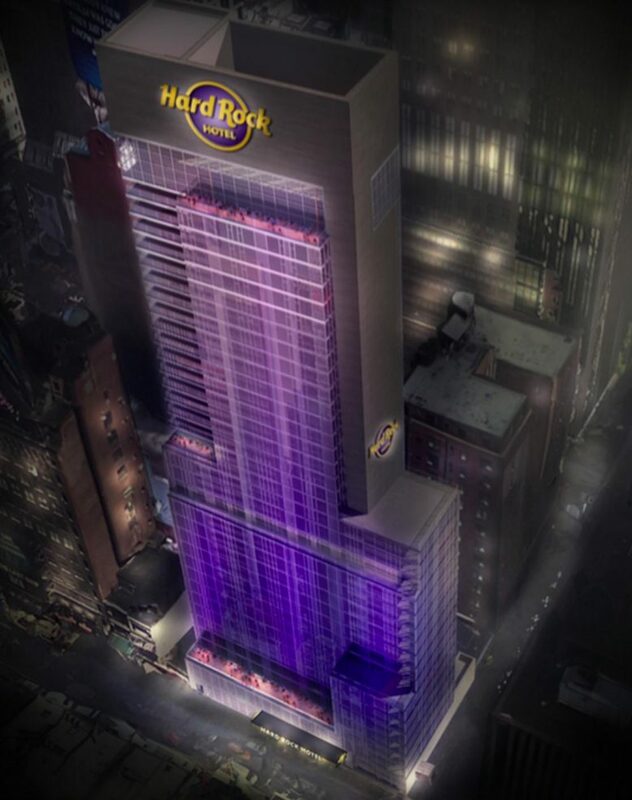 Over the weekend, it was revealed, by the New York Post, that Extell Development is partnering with Hard Rock International to build a Hard Rock Hotel at 151-159 West 48th Street, located mid-block between Sixth and Seventh avenues, near Times Square in Midtown. Now, a rendering and additional details have been released in a Curbed NY report. The hotel tower will boast 445 rooms, a lobby lounge, a restaurant and bar, a rooftop lounge, and an underground speakeasy-style establishment. The hotel will also feature iconic music memorabilia, like many Hard Rock locations do. The 13,153-square-foot site is currently occupied by a seven-story parking garage and a five-story tenement building. Permits were filed to demolish the garage in February. The assemblage can accommodate 180,336 square feet of commercial development as-of-right. Additional air rights can be acquired elsewhere on the block and from around the district, as the site sits within the special Times Square zoning district.